Potatoes, sweet potatoes, onions, garlic, and rosemary, ready to go into the oven and roast for forty-five minutes. 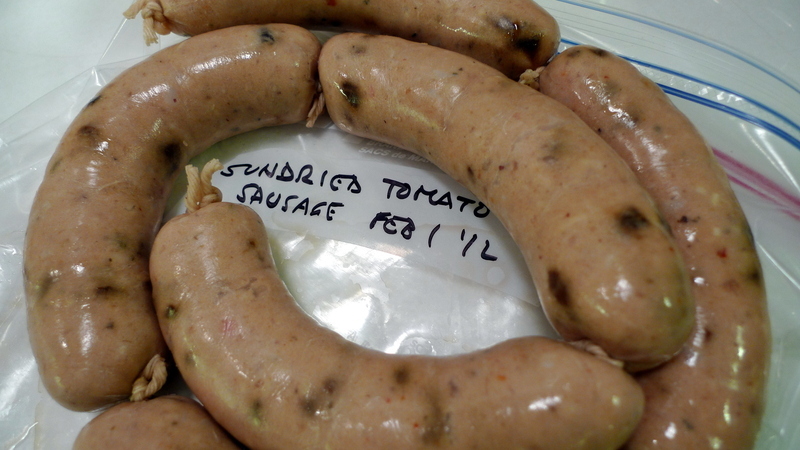 Some pork sundried tomato sausage I made earlier this month and froze. Boiled it for a few minutes in beer before putting it on top of the half-cooked vegetables to finish in the oven. 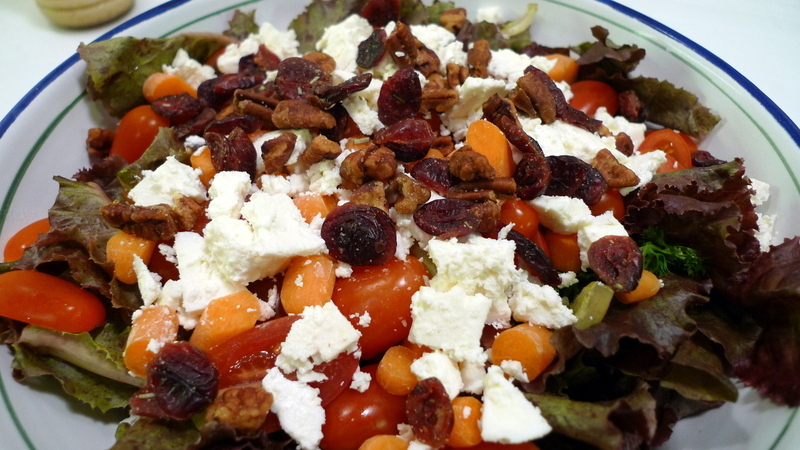 Prepared a healthy salad of red leaf lettuce, carrots, and tomatoes with some feta cheese, dried cranberries, and pecans. Served with a Japanese style sesame dressing. 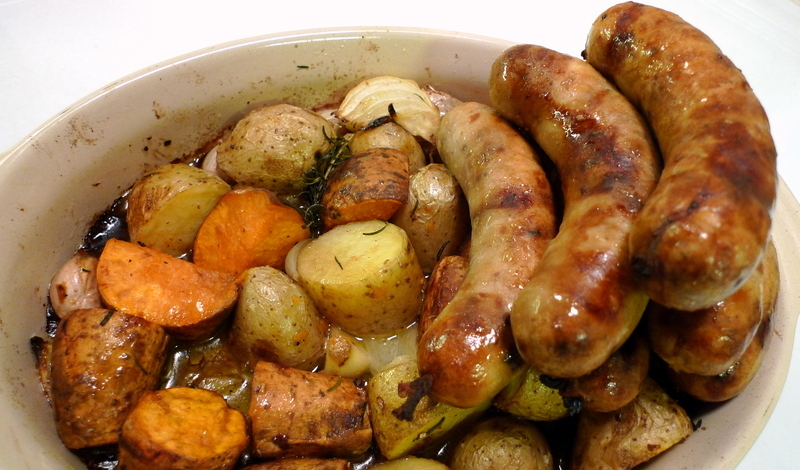 The roasted vegetables and sausages come out of the oven, ready to eat! This entry was posted in Uncategorized and tagged cooking, Dinner, food, Sausage by christao408. Bookmark the permalink. Oh, my — that looks easy, and yummy! I can’t wait till I once againi have a kitchen! Yummy and you made it look so easy! I guess the dishes just evened out….a healthy salad and then the fatty sausages!! I’d like to invite you to my next party. I could always use a second hand in the kitchen. The Thais eat sweet potato? Oh yeah…. you just need some sauerkraut and beer! I’m curious, what did you do with the beer after it you cooked the sausages in it? Chris, did you add any water or broth to the vegetables before you stuck them in the oven?Looks delicious. 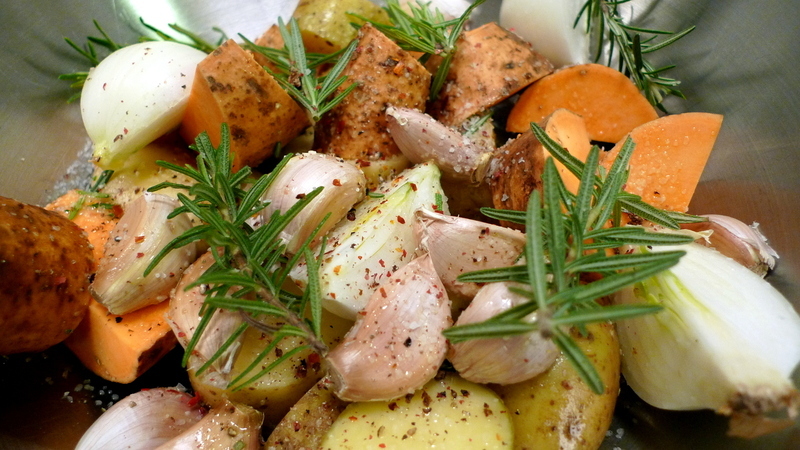 Love the roasted veggies with rosemary. Will certainly give it a try! God, that looks incredibly good, but especially the salad! @ElusiveWords – Poured it out. @yang1815 – If they came from anyone else, they would. I’ll cut you some slack, though. @fauquet – Thank you very much for the kind comment. @grannykaren – Yes, a big salad with lots of different vegetables makes for a fantastic meal. @ZSA_MD – No water or broth, just coated with some olive oil.